Is REA Selling a Stolen Letter from the Baseball Hall of Fame? Will Cooperstown’s Cover-Up Continue? 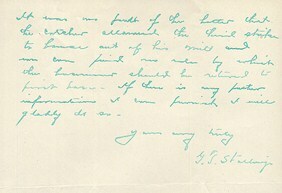 1916 George Stallings protest letter. Last year, when the Hall of Fame received their REA catalogue, it was soon after determined that the New Jersey auction house was selling a rare cabinet photo of Hall of Famer Mickey Welch that had been stolen from the Hall’s National Baseball Library. REA withdrew the Welch photo, which had Hall of Fame ownership marks on its reverse, and also withdrew several other documents suspected to have been wrongfully removed from the Hall of Fame collection. This year, when the Hall of Fame receives their REA catalogue in the mail, they will see yet another item suspected to have been stolen from their National Baseball Library; a dead-ball era letter written to protest a game between the Boston Braves and Chicago Cubs. REA is offering a handwritten letter by Boston Braves manager George Stallings regarding a protested National League regular season game in 1916. The letter is similar to several other Stallings letters currently found in the “Protested Games” files at the National Baseball Library in Cooperstown and is suspected to be one of the many items that were part of an alleged multi-million dollar heist of rare baseball materials from the library in the mid-to-late 1980s. 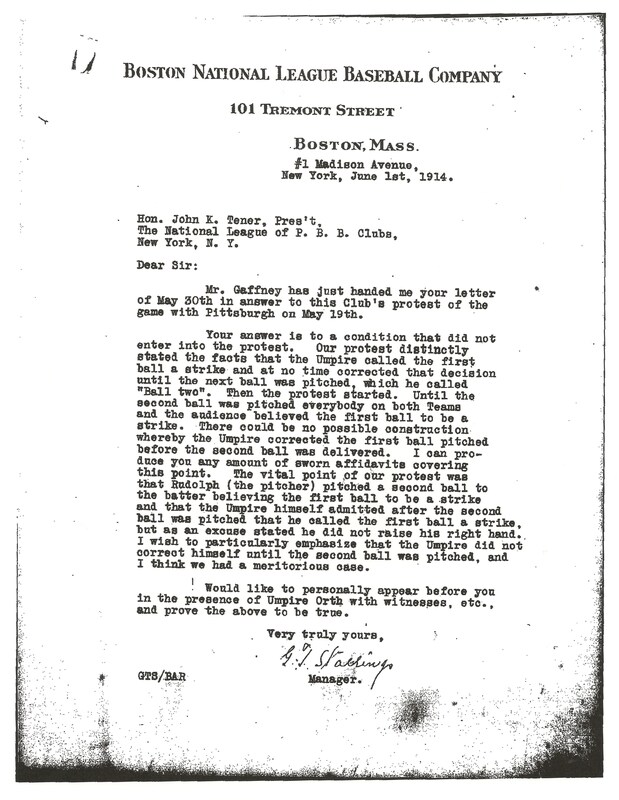 In addition, the Hall of Fame files currently include the Boston Braves’ letter which withdrew Stallings’ protest made on May 12, 1916. The current REA offering focuses heightened scrutiny on the developing controversy at the Baseball Hall of Fame related to the alleged thefts of documents from their famous “August ‘Garry’ Herrmann Papers”collection. Hall of Fame officials appear to have never properly investigated the alleged thefts from the 1980s and appear to have been negligent in pursuing the recovery of documents suspected to have been removed from their Herrmann files. In February, another document suspected to have originated from the Hall’s Herrmann archive appeared for sale by Steve Verkman in his Clean Sweep Auction. The auction lot was a 1924 letter addressed to August Herrmann by St. Louis Cardinal owner Sam Breadon and appeared to have originated from a group of correspondence between Breadon and Herrmann spanning the years 1920 to 1926. Currently the Hall of Fame stores those letters in “Box 51, Folder 5″ of their Herrmann Papers archive. Auctioneer Verkman, when made aware of the likelihood that the letter originated from the Hall of Fame files, contacted Cooperstown officials for their input. Verkman said he was told by Hall of Fame spokesperson, Brad Horn, “There (was) insufficient information for us to unequivocally state that these were stolen from the Hall of Fame.” According to Verkman, the Hall of Fame did not even inquire how his consignor acquired the letter, nor did they inquire about several other letters to Herrmann that Verkman had sold in his previous auctions. When asked, Steve Verkman declined to reveal any details related to his consignor or the provenance of the Breadon letter. With the Hall of Fame failing to conduct their own investigation or stop the sale, the letter sold for $360. The lack of due diligence conducted by the Hall of Fame regarding the Breadon letter and the Hall’s failure to pursue recovery led auctioneer Josh Evans, of Lelands, to comment on the Hall’s response to Clean Sweep. “Now they are complicit in their own degradation,” Evans said. The 1916 George Stallings letter currently being sold by REA appears to be one of many suspected to have been removed from the Hall of Fame’s Herrmann archive and, in particular, from the files regarding National League “Protested Games” spanning from 1902 to 1926. The massive Herrmann archive, featuring over 45,000 documents, was donated to the Hall of Fame by Cincinnati Reds owner Powel Crosley Jr. in 1960. The archive included the personal and business papers of Reds owner August Herrmann spanning from 1902 to 1930, as well as the papers of Baseball’s National Commission, the game’s ruling body before the office of “Baseball Commissioner” was instituted for Kenesaw Mountain Landis in 1920. Herrmann was the National Commission’s Chairman and he acted as baseball’s final authority in deciding matters including issues regarding protested games. After sitting in boxes at the Hall of Fame since 1960, the entire collection was conserved and catalogued by librarians at the National Baseball Library in 2005. Only half of the collection has been microfimed. A finding aid was created by the library showing that ”Box 44″ of the collection features files from “Protested Games, 1902-1926.” File folders numbered four through twenty-four include correspondence, affidavits and other documents related to ‘Protested Games” that were reviewed by Herrmann’s National Commission. 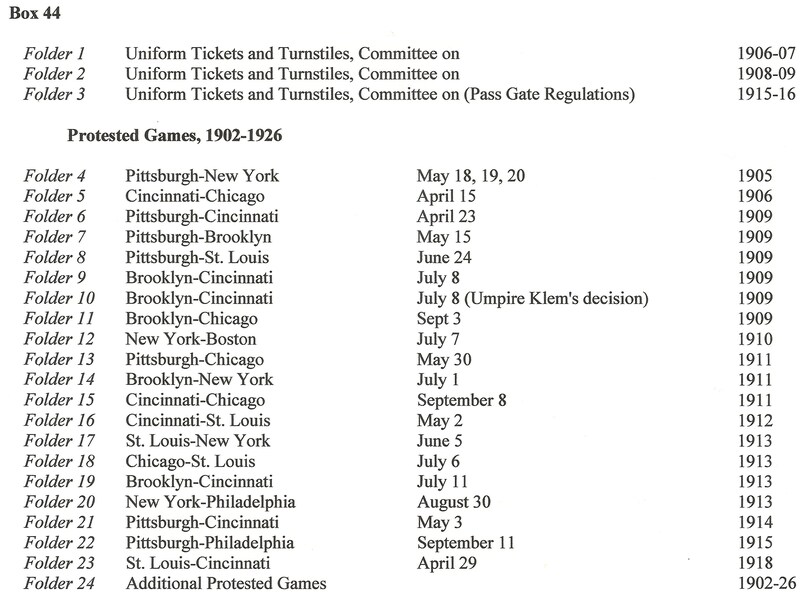 Each protested contest file, and a seperate file designated “Additional Protested Games,” include official protest letters to League Presidents as well as statements made by players, umpires, managers and even spectators. The largest file in the collection is from the baseball’s most controversial protest of the infamous “Fred Merkle” game of 1908. Lot 1034 in REA's spring auction is a letter written by George Stallings protesting a game played by his Braves on May 11, 1916. The letter, addressed to NL President John Tener is similar to many written by Stallings which still reside in the HOFs Herrmann Papers archive. 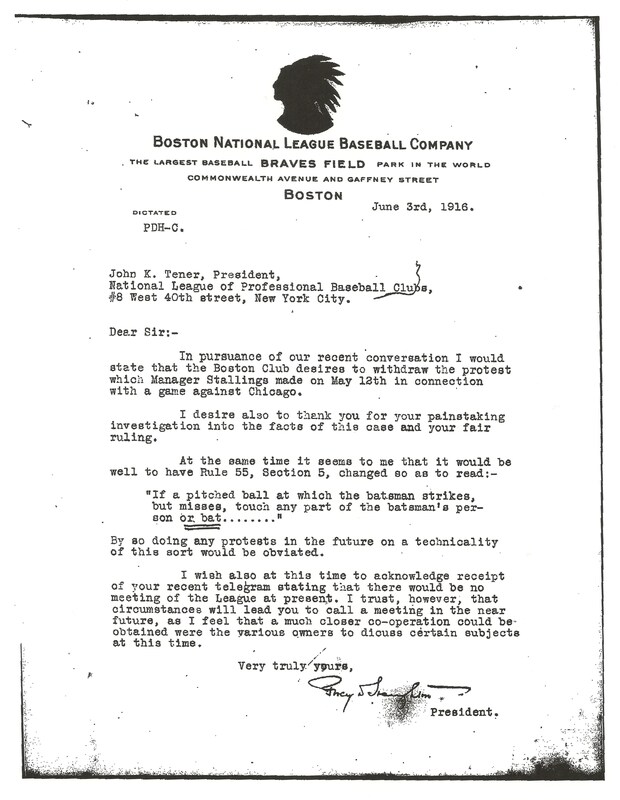 The letter that Stallings wrote on May 12th to President Tener, was followed up by another letter written by Boston Braves team President, Percy D. Haughton, on June 3rd, 1916. 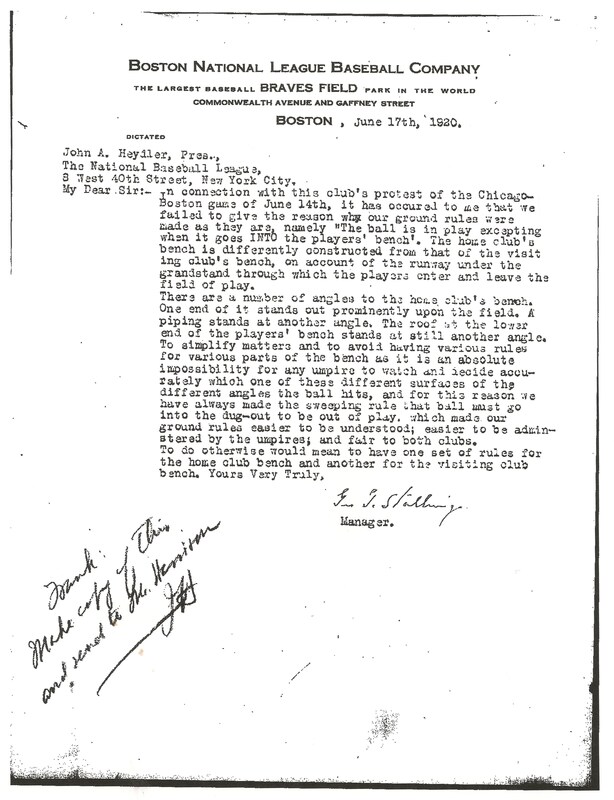 In that letter, also addressed to NL President John Tener, Haughton writes, “I would state that the Boston Club desires to withdraw the protest which manager Stallings made on May 12th in connection with a game against Chicago.” The letter of protest he refers to is the exact same letter being offered by REA. 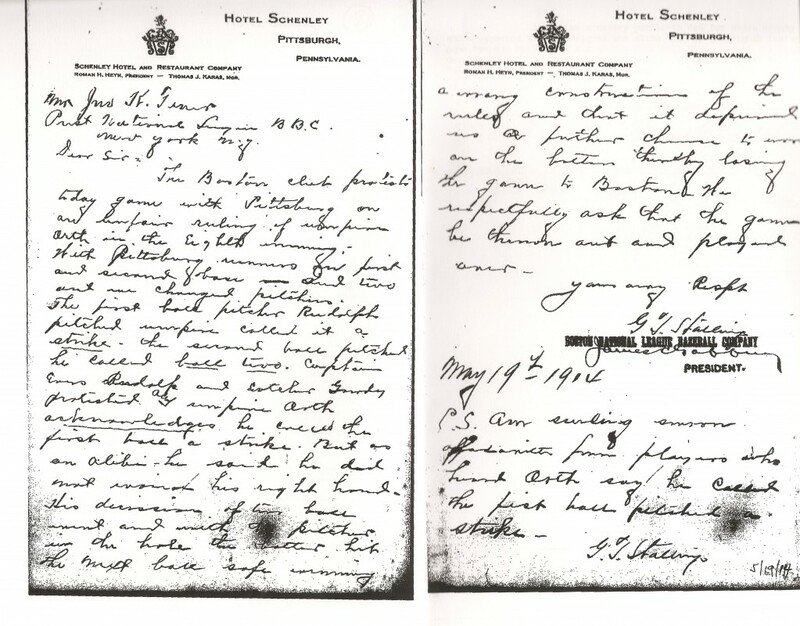 The letter written by Haughton is currently located in “Box 44, Folder 24″ of the Herrmann Papers archive at the National Baseball Library. The HOFs files still retain this letter written to NL President John Tener, nullifying the protest requested by the letter being sold as Lot 1034 in REA's spring auction. 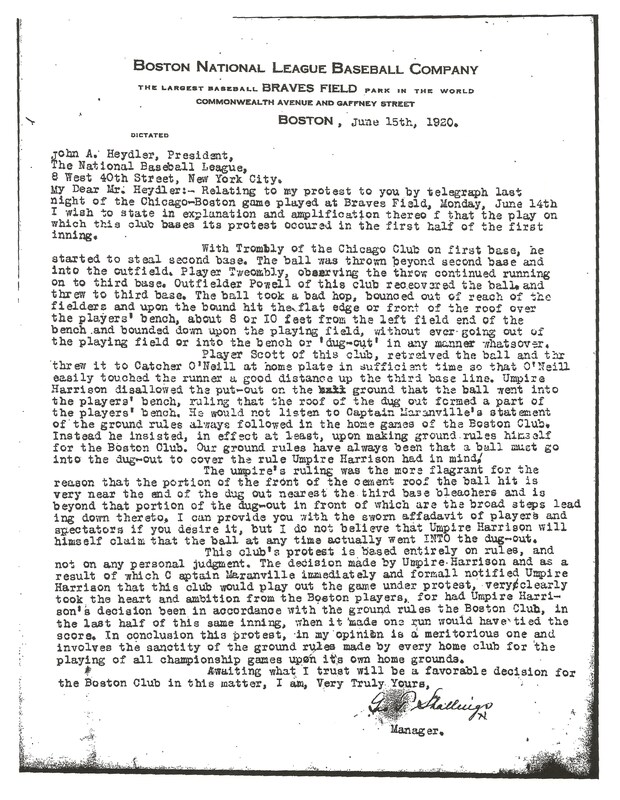 This letter (above) written by George Stallings to NL President John Tener protests a game played against Pittsburgh on May 19, 1914. It is currently located in the Herrman Papers’ “Additional Protested Games” file. This letter (above) in the HOF’s Herrmann archive was also written by George Stallings to NL President John Tener on June 1, 1914 in regard to the protested game on May 19, 1914. It is currently found in the HOF’s collection in “Box 44, Folder 24″ of their Herrmann archive. This protest letter (above) is currently located in the Hall of Fame’s ”Additional Protested Games” file and was written by Stallings to NL President John Heydler on June 15, 1920. 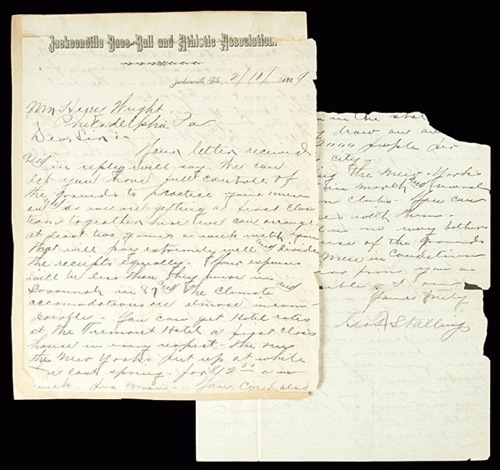 How could the 1916 Stallings letter, so closely related to similar documents that are currently part of the Hall of Fame’s holdings in their Herrmann archive, be in private hands and offered for sale at auction? The other Stallings letter sold by REA in 2009, was stolen from the New York Public Library and their famous A. G. Spalding Baseball Collection. The 1889 Stallings letter sold by REA was once part of a scrapbook of correspondence addressed to baseball pioneer Harry Wright. The REA letter sold in 2009 is currently in the possession of the Federal Bureau of Investigation as evidence in their on-going probe into the consideranble thefts of baseball artifacts from the NYPL’s Spalding Collection. The Stallings letter sold by REA in 2009 was affixed to scrapbook paper believed to be from the NYPL’s Harry Wright Correspondence Scrapbooks. Sources close to the FBI investigation indicate that forensic testing of the scrapbook paper will further link the REA letter to the stolen NYPL scrapbooks. The confirmation that the 1889 Stallings letter and scores of other NYPL letters cited in works written by historians Harold Seymour and Dorothy Seymour Mills were stolen from the Spalding Collection illustrates how rare baseball documents in institutional collections have been targeted by thieves for many decades. This 1889 George Stallings letter written to Harry Wright appeared in REA's 2009 auction. It was stolen from the NYPL's famous Spalding Collection and is currently in the possession of the FBI. Unlike the Baseball Hall of Fame, the New York Public Library has been proactive in their efforts to recover items stolen from their collection. When letters stolen from their Harry Wright Correspondence Collection appeared for sale at Major League Baseball’s All-Star Game auction in 2009, the NYPL enlisted the assistance of the FBI to spearhead the recovery of their materials. In 1988, New York auctioneer Josh Evans alerted the Hall of Fame that he had purchased a signed photograph of Babe Ruth that had the museum’s accession number on the back covered with wite-out. Evans revealed that he he had purchased the photograph from California dealer Mike Gutierrez. Ex-National Baseball Library employee Bill Deane recently stated in previous reports that after Evans’ 1988 revelation, the Hall of Fame enlisted the help of the FBI and an investigation was launched with Gutierrez as its main focus. 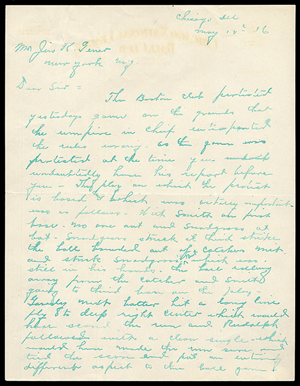 Josh Evans also claims that he had spoken to an eyewittness to the Hall of Fame thefts who told him he saw Gutierrez, “steal a Nap Lajoie letter from the August Herrmann archive.” An ex-Hall of Fame official confirms that Gutierrez was one of the few researchers ever to have access the Herrmann Papers archive prior to 1990. The reality of the thefts from Cooperstown, however, has been documented in the recent identification and return of items which were stolen in the 1980s. The recent returns of these items to the Hall of Fame also illustrates how the thefts from the NBL were never properly investigated. Unlike the documents from the Herrmann archive, many rare photographs stolen from the National Baseball Library bear identifying ownership marks which have helped facilitate their identification and return. Last year, Robert Edward Auctions withdrew the rare nineteenth century photo of Mickey Welch from their annual sale after Haulsofshame.com informed the auction house that the photo had Hall of Fame ownership marks and was confirmed as having been stolen from the National Baseball Library. Sources indicate that the rare Welch card has been returned to the Cooperstown institution that has been victimized by the alleged thefts of hundreds of items exceeding a million dollars in value. In that same 2010 sale, REA also withdrew another auction lot of sworn affidavits suspected to have originated from the Herrmann “Protested Games” files. Sources indicate that those documents have not been returned to the National Baseball Library. As a result of reports published by Haulsofshame.com, other items stolen from the Hall of Fame’s collection have also been returned including a rare cabinet photo of Christy Mathwewson and a W-600 cabinet card of Ed Abbaticcio. The Mathewson cabinet card sold for $12,000 at auction in 2008. We asked Hall of Fame spokesperson Brad Horn and head librarian Jim Gates if they had any explanation as to how REA’s 1916 Stallings protest letter to President John Tener was seperated from the follow-up letter written by the Braves team president to Tener withdrawing that same protest? We also asked them how REA’s Stallings letter was in private hands, when it appears that so many of Stallings’ protest letters are currently located in the Herrmann Papers files? Horn and Gates did not respond to our inquiry. We also asked Hall officials if they had enlisted the assistance of the FBI to investigate the regular appearances at public auction of items suspected to have originated from their Herrmann archive? The Hall of Fame failed to respond to our inquiry. A source close to the FBI investigation of the thefts from the New York Public Library confirmed that unless the Baseball Hall of Fame formally engages the FBI, they cannot investigate the matter on their own. AS FAR AS I AM CONCERNED, THEY ARE ALL IN CAHOOTS WITH ONE ANOTHER TO ROB THE PUBLIC, AS THEY ALL ARE A BUNCH OF THIEVES AND THE DOORS SHOULD BE SHUT FOREVER. good job by rea in withdrawing the letter from their auction. Too bad clean sweep auctions didnt have as much sense when they were informed about the herrmann letter they sold. I am disappointed to learn that the Hall of Fame refuses to acknowledge that its documents are being stolen and sold and is reluctant to align itself with the FBI, which has been so helpful in reclaiming documents for other libraries. Honestly, is nothing sacred. Why is this such an open secret?